This is 1 yard of a red with white swans fabric. It is 44" wide and it is 100% cotton. I indicated this was used because I am not cutting it off a new bolt of fabric. Color display on your computer may differ. PURPLE FIESTA FABRIC. 100% Cotton Fabric. Length: 1.25 yd. Pattern: Red background.White bare branched tree. Fabric:Cotton Blend. Color: Red, White, Green. Fabric is pre-owned, but unused in excellent condition. My fascination with treasure hunting started when I was producing and directing musical productions. Vtg Christmas Paisley Pine Evergreen Red Tablecloth Fabric Craft Cutter 49"x72"
Like new condition but previous owner neatly machine stitched edges and made a tablecloth. A great piece for your next Holiday project or for inspiration for those to come! 100% cotton 44"-45" wide x 2 yards 16" long. 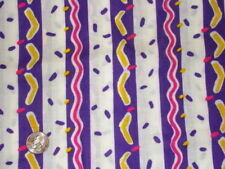 100% cotton quilt fabric priced by the piece, one yard x 44". Excellent quality hessian and lace ribbon. 1 X Burlap Hessian Ribbon with Lace. Ribbon Width: 5cm. We are committed to your good buying experience from us. If you are not satisfied when you receive your item. I do have a small terrier, however, she stays away from my fabric. This beautiful fabric has large white poinsettia's with gold thread throughout & white holly berries. 100% cotton soft fabric. This is a beautiful holiday piece, featuring poinsettias on a cool blue background with metallic highlights. Fabric is 100% cotton 1yd 26" long by 44" wide..
Top Rated SellerFrom United StatesBrand: UnbrandedColor: Multi-ColorWidth: Less than 45"
Wonderful fabrics for holiday projects! 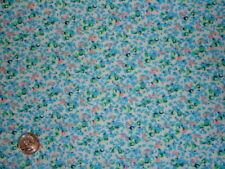 100% cotton 44"-45" wide x 2 - 1 yard long pieces total 2 yards. TINY BLUE PRINT FABRIC. 100% Cotton Fabric. A great piece for your next Holiday project or for inspiration for those to come! 100% cotton 44"-45" wide x 1 & 3/4 yards long. I BELIEVE THAT THIS FABRIC IS FROM THE 80'S. FABRIC LOOKS PRETTIER IN PERSON. IT WAS MY GRANDMOTHER'S MATERIAL. Pattern: Pine cones, berries and evergreen boughs on tan. Color:Tan, green, brown, red. Fabric is pre-owned, but unused in excellent condition. Width: 44". My fascination with treasure hunting started when I was producing and directing musical productions. Length: 1.5 yds. Browsing through this collection will really put you in the Christmas spirit! Fabric: Cotton (Blend?). My fascination with treasure hunting started when I was producing and directing musical productions. Jingle Brights Fabric. Kangaroo and Joey by Keri Schneider for moda. Cotton Fabric suitable for crafts or quilting. 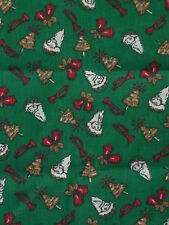 Christmas and New Year Colored Cotton Fabric 36" (1 yard) (91.4 cm). Length: 36" (1 yard) ( 91.4cm). Red with 1/4" White Polka Dots Fabric is a beautiful pure cotton fabric with. a lovely pattern.This fabric is an ideal material to use for fabric projects. HERE IS 1 YD X 44" W OF COTTON FABRIC. LIGHTLY GLITTERED. Fabric: Cotton or cotton blend. Holly wreaths with bells on green background. Christmas Fabric. PEFECT FOR A PONCHO.VERY TRENDY ADDITION TO YOUR WARDROBE. PERFECT FOR ANY SEWING OR QUILTING PROJECT. MADE OF SUPER SOFT WOOL LIKE FABRIC. 100% cotton fabric for quilting or crafts. Folk art style santa train with toy animals. Green and maroon on a speckled beige background. 1 yard 27" x 44W. Santa Claus and reindeer on blue background (see photos). Christmas Fabric. 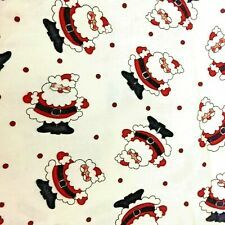 100% Cotton Fabric Chritmas Red Pattern 2YD Condition is New. Shipped with USPS First Class Package. Inventory#1U19. Colors- Red, Green, White. Inventory#1U12. Colors- Green, Red, White. 00% Cotton Fabric pre-washed. 1.8 yards long, 68" x 42". Up for your consideration:Plaid; manufacturer unknown. This fabric has a Christmas plaid in red, yellow, blue and green. Fiber Content: 100% Cotton. Photos are taken with selvage edges of fabric to the left and right sides of the photo. 1+ Yard Red Green Christmas Print Diamonds Cotton Quilting Fabric 59" X 44"
I am cleaning out my fabric stash -. Most fabric is not washed or ironed. I tried to be accurate on the type of fabric but I am not an expert. 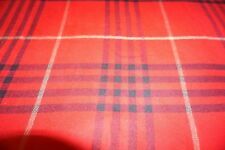 1 Yard Christmas Red White Plaid Cotton Quilting Fabric 57" X 44"
I tried to be accurate on the type of fabric but I am not an expert. I am cleaning out my fabric stash. Most Fabric is not washed and also needs a good ironing. I would love a picture of finished product. Poinsettia Design. 38" long x 72"wide Double Border. Fiber Content: 100% Cotton. Frankie the fish says "Buy the FABRIC!". Lots of great buys! Width: Up to 60". I have a lot more inventory to list! Fabric Red w/Holly & Christmas Flowers 100% Cotton 1 yd. 44/45" wide x 1 yd. 100% COTTON FABRIC RED WITH HOLLY AND CHRISTMAS FLOWERS. Also most are OOP. I replace earring backs with new earring backs. All pictures are of actual item, you are purchasing ONLY what you see pictured. Christmas Decorated Squares Holiday 100% Cotton Quilt Quilting Fabric 1+ Yds! Weight/type of fabric --　100% Cotton. NO EXCEPTIONS! NOTE . 1+ Yard Purple Blue Yellow White Medium Calico Cotton Quilting Fabric 52" X 42"
I tried to be accurate on the type of fabric but I am not an expert. I am cleaning out my fabric stash -. Most fabric is not washed or ironed. 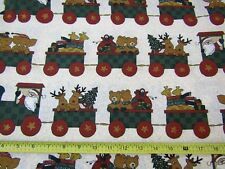 2+ Yards Christmas Mistletoe Sprigs Vintage Cotton Quilting Fabric 76" X 45"
I am cleaning out my fabric stash. Most Fabric is not washed and also needs a good ironing. I tried to be accurate on the type of fabric but I am not an expert. I would love a picture of finished product. Condition – New. No stains/flaws - photo reflects spots that are NOT on fabric. If I will be out of town and/or delayed, I will advise you. Weekends I am able to check more frequently. Ruby Red Clear Sequins Stretch Knit Sewing Holiday Evening Fabric 1+ Yds! Condition – New. No Stains/Flaws. Photo reflects spots that are NOT on fabric. If I will be out of town and/or delayed, I will advise you. Weekends I am able to check more frequently. 1 yd 12" by 44/45". It says on the edge - Not intended and not suitable for use in children's sleepwear. I have acquired a large quantity from a fabric estate. 100% Cotton. Christmas Plaid Appliqués Fabric Use on craft, children's clothes, apron, etc. CHRISTMAS PLAID APPLIQUES. This yard of fabric is appliques to use on crafts, childrens clothes such as aprons, skirts, sweat shirts-use your imagination. Get an early start on next Christmas' list!